I followed Xandria’s career right from their 2003 debut album Kill The Sun, followed by the 2004 sophomore effort Ravenheart. At first attracted by their exotic name, I discovered a young and promising band with a clean and good presence. Lisa Middelhauve’s soft and caressing voice was shining in the big picture of the band, reminding me of other similar European female voices, the likes of Liechtenstein based Elis’ Sabine Duenser or Austrian Edenbridge’s Sabine Edelsbacher being the closest types. Playing a soft gothic rock, emotional and warm, with good guitar harmonies, spherical keyboard wall of sounds, with Lisa’s beautiful voice, Xandria music appealed to me in many ways. The only thing that I found missing in their compositions was a better balance between the softer parts of the music and the heavier/more energetic guitar supported parts which (in my opinion) would have improved the overall sound and would have conferred more personality to the band. So, 2005 brought us the third Xandria album; being the third album in so many years, you could tell that the band means business and is determined to leave their mark on the crowded music industry. To my absolute delight, this time the sound of the band has improved dramatically, aside from Lisa’s excellent voice (she sounds better than all her previous work), the dual guitar attack of Marco Heubaum and Philip Restemeier is right where it should be, leading the score, bringing heaviness and powerful to the compositions, fully supporting the suave vocal parts, enhancing their mystery and beauty. Furthermore, the subject of the album (Christopher Columbus’ journey westwards to set a new course for the rich India) allowed the band to take its own journey of re-discovery (I wouldn’t go that far to say re-inventing, because this is STILL Xandria, with all the good parts of the first two albums and some new excellent and improved sides), showing that sometimes it’s not just about the goals that you set in your life, but mostly about the paths you take and the choices you make in trying to reach that goal. It’s strange how two of the best albums of gothic music in 2005 share the same idea, a journey towards the American continent, which in fact turns into an experience of self discovery (I mean of course Leave’s Eyes’ Vinland Saga and the present album). Aside from the new improved sound of the guitar pair, the band has also used a symphonic ensemble, namely the "Deutsche Filmorchester Babelsberg" bringing majesty and more atmosphere to the sound, an Irish folk band that is masterfully used in two of the softer song on the album, the lovely ballads Like A Rose On The Grave Of Love and on The End Of Every Story. As the title of the album implies, we are also treated with some oriental themes on the album, the opener India having an oriental based guitar riff, solid drumming with high range vocals from Lisa Middelhauve. A very strong opener that shows us right from the beginning that the band has taken a more powerful approach towards the compositions, shifting from the pop-sound of the previous albums to a gothic metal style. Oriental sounds can also be noticed on the powerful slow paced Black & Silver with its soprano lines backed by full orchestral sound. The superb keyboard driven Now & Forever is definitely single material, with its caressing vocals, dripping keyboard lines and a superb backing female vocals. Beautiful quiet ballads like In Love With The Darkness or Dancer are balanced by heavier tunes: Fight Me with it’s tight drumming and eerie atmospheric vocals (similar to Marcela Bovio on Embrace The Storm), the guitar driven Widescreen, a typical gothic tune with excellent inspired solos and good pace changes throughout the song, or Who We Are with its melancholic and complex sound, balanced between the warm keyboard wall of sound and lyrical clear vocal parts. Winterhearted is a quiet powerful song with a slow development leading to a full mid paced vocal/guitar lead conclusion. Finally, Return To India is the natural conclusion of the album, with the same oriental theme as the opening song, powerful rhythmic drumming and complex structure, alternating the softer parts with powerful guitar lines. Conclusion: this album is a must for every goth fan and for every fan of intelligent and beautiful music. 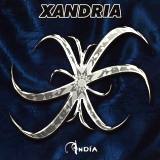 Benefiting from an excellent production (Jose Alvarez-Brill) that allows every instrument to play its part in the grand picture, blending the symphonic orchestra and the Irish folk sounds with the metal core of the music, Xandria has managed to release its best album to date. Decision to make 2006 a year of heavy touring can only help this gifted and talented band take its music to wider audiences and secure a place at the top of gothic music. They fully deserve it.